Just outside the centre of always vibrant Maria Alm lies this beautiful house. 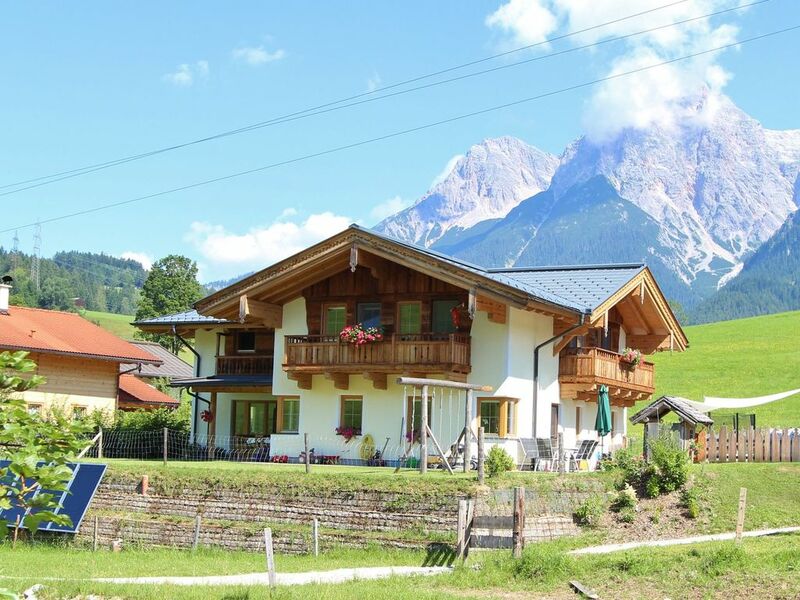 The location is perfect; in summer you can enjoy the swimming pool and tennis courts as well as the many hiking paths and mountain biking routes on your doorstep, and in winter you can enjoy the nearby cross country ski runs; if there's enough snow, you can ski almost entirely back to the house. Your holiday home is situated on the first floor and has its own entrance, ensuring you have enough privacy. The interior is very tasteful and due to the many wooden details it immediately feels warm and comfortable. The spacious living room has an open kitchen as well as direct access to the spacious balcony with a beautiful view. There are also two large bedrooms, a bathroom and a separate toilet. There is some playground equipment in the garden, which kids can make use of. Maria Alm, located at an altitude of 800 metres, is a holiday village at the foot of the Hochkönig, where snow is guaranteed in winter. The ski area Hochkönig with 150 km of slopes is part of the Ski Amadé. In addition to skiing, you can also have fun hiking or tobogganing here. A large network of ski runs for cross country skiers makes Maria Alm an ideal winter sports destination. Maria Alm is famous in all seasons, and there's always something to do. The beautiful nature, plenty of hiking trails, mountain biking routes, or one of the many beautifully landscaped golf courses make sure that the village is worth a visit year-round. Maria Alm ist ein wunderbarer, kleiner Ort, der trotz Tourismus seine Ursprünglichkeit nicht eingebüßt hat. Die Ferienwohnung und die Gastgeber waren super. Es lässt sich sehr gut wandern! Wir sind mit unserem Kurzurlaub in Maria Alm super zufrieden. Die Lage des Hauses mit dem Ausblick auf die Berge fanden wir toll. Die Wohnung ist sauber und gut ausgestattet. Die Vermiter sind sehr nett und freundlich. Heerlijke vakantie in een prettige omgeving. Fijn met kinderen, zwembad dichtbij! Prettige ontvangst. Maria Alm is een leuke plaats. Wij komen hier zeker nog eens terug. Onze vakantie was super, de omgeving en de ligging van het vakantiehuis zijn ideaal. Een prachtig zwembad naast de deur op loopafstand met nederlandse medewerkers. Het huis was bij aankomst superschoon en netjes. Ook de eigenaren waren zeer vriendelijk en behulpzaam. In de omgeving is heel veel te doen voor alle leeftijden. Kortom een topvakantie!! !